CaboLabs Blog - EHRServer v1.4 was released! We are very excited to announce the new version of the EHRServer is here. EHRServer is the Open Platform for Managing and Sharing Clinical Data compliant with the openEHR standard, and allows to use SNOMED CT expressions to query clinical data. EHRServer is the first open source Clinical Data Repository compliant with openEHR. From its beginnings in 2013 as a proof of concept, it has became a robust and flexible open source product, which we also provide in the cloud as a service. If you need a standardized clinical data repository for your next health app project, try EHRServer, for fast prototyping and get a robust and standardized information platform underneath. BTW, next month we will have an EHRServer Workshop Online, check our education page for more details. We did dozens of improvements, optimizations and fixes, but this version has two major additions. Now the full data tree is shown on the data point selection for queries, instead of the plain list from previous versions. The new tree view shows the real structure defined by openEHR archetypes included in the query. 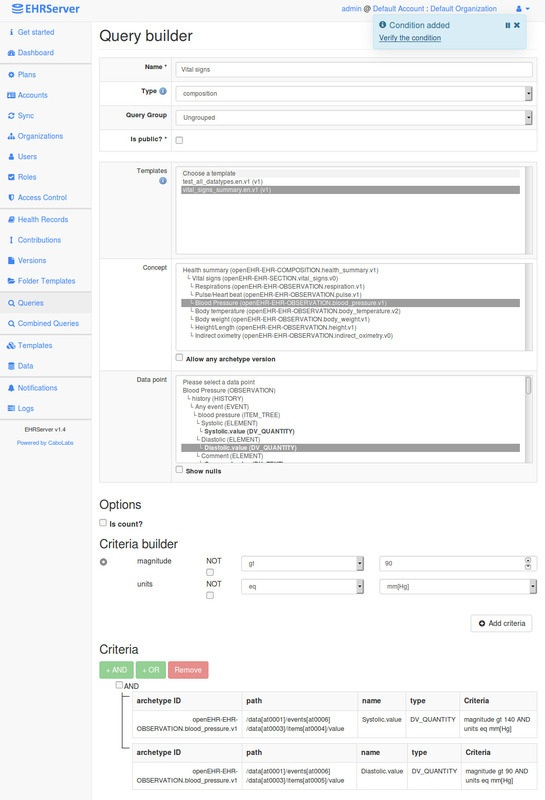 Alongside with the complex criteria builder released on EHRServer v1.3, this new Query Builder one of the most simpler to use and feature rich query builders for openEHR data. The EHRServer Sync API opens a new world of possibilities on building health care records based on the EHRServer. This API allows to replicate EHRServer data in a cluster of EHRServer instances, allowing automatic backup and load balancing, specially for queries and data analysis. The Sync API is not based on any database specific sync technologies, but in an application level API, where internal business rules are checked and security allowance should be in place to be able to sync servers, instead of blindly synchronizing data between databases. This feature will open the door for EHRServer High Availability, scaling architectures based on the EHRServer. The configuration of a cluster is very simple. 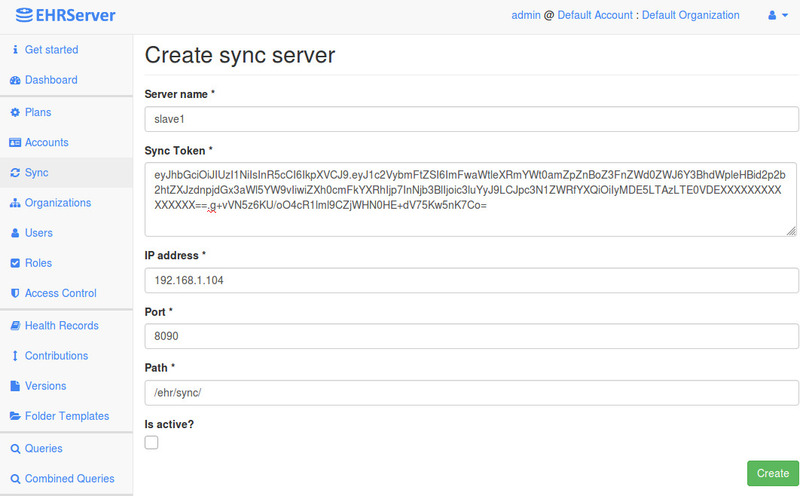 The EHRServer instances that will receive data (act as slaves) need to generate a Sync API Token, that will be configured on the servers sending data (master), then the synchronization happens automatically. Check videos, tutorials and demos on our YouTube channel.